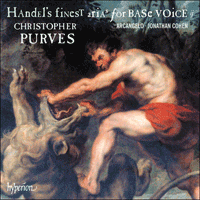 Christopher Purves is renowned for both the powerful sense of dramatic conviction he brings to everything he undertakes, and for a vocal technique which must be heard to be believed. From Handel’s early cantata to selections from Italian opera and English oratorio, this is a recital from a very special singer indeed. No other composer of the early eighteenth century matched Handel’s use of musical vocabulary to convey the gamut of complex dramatic personalities. This album features an assortment created throughout the composer’s long career, from an early Italian cantata to his English oratorios written forty years later. These examples contain humour, cruelty, affection, tyranny, loyalty, culpability, mournfulness and celebration (and sometimes more than one of these), and illustrate how Handel responded imaginatively and engagingly to the predicaments of different characters. Several are political tyrants whose lust for power (or a woman, or both) sends them out of control, others are menacing bullies for whom we may feel a mixture of disgust and empathy, but the bass voice was also usually the composer’s preference for anxious fathers worrying about their children, or faithful stalwarts in times of political upheaval and warfare. After leaving his native Halle in his late teens, Handel was introduced to opera in Hamburg, and then toured around Italy for over three years. Whilst in Naples he composed Nell’africane selve (HWV136a) in summer 1708. 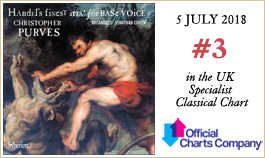 Accompanied only by basso continuo instruments, this chamber cantata is a virtuoso tour de force which navigates sudden dramatic contrasts, vivid imagery and wide leaps across a range of more than two and a half octaves (from a bottom C sharp to a top A). The volatile introductory recitative observes that even a proud, majestic lion in the forests of Africa, immune to howling beasts and hissing snakes, can have its courage shaken if startled by the insidious bright torch of a hunter; the poem continues to reveal that the powerless lion’s miserable weeping upon its capture is an allegory for the poet’s own loss of liberty and confidence now that he has fallen deeply in love with the Arcadian beauty Nice. There are fiendish technical challenges in the aria ‘Langue, trema, e prigioniero’, but the music is also melodious and intimately lyrical, and the melancholic conclusion ‘Chiedo amore’ can be interpreted seductively. The identity of the original singer is unknown, but it was probably the same extraordinary bass who sang the murderous cyclops in the serenata Aci, Galatea e Polifemo (also performed in Naples during summer 1708). Within a few months of leaving Italy, Handel was employed by the Elector of Hanover (soon to become George I of Great Britain), but he was immediately granted permission to travel to England in late 1710. Soon after his arrival he was commissioned to compose Rinaldo (1711)—the first all-Italian opera to be created especially for the London stage. The villanous Argante is the infidel king of Jerusalem; after his aggressive parleying with the Christian crusader heroes has amounted to nothing, he is left alone and summons Armida—a fickle Amazonian sorceress whose assistance he desperately needs to defeat the enemy at the gates. She is not only Argante’s secret weapon but also his lover—as is explained in the wistfully murmured invocation ‘Vieni, o cara’ with transparent eroticism. In 1712 Handel settled permanently in London, but between 1717 and 1720 he spent at least some time as a guest at Cannons, the country estate of James Brydges, the Earl of Carnarvon. The first English oratorio Esther was probably performed for Brydges in about 1720: the prideful and spiteful counsellor Haman gleefully plots the genocide of the exiled Jews, but his cruel treachery is exposed by the Persian king Assuerus’ new and hitherto secretly Jewish queen Esther. Upon being sentenced to death by the indignant king, the shaken Haman beseeches Esther to forgive him and intercede on his behalf (the hushed ‘Turn not, O Queen, thy face away’, with gently pulsing strings). The wily politician’s honey-tongued petition for clemency is rejected firmly by Esther—forcing him to confront the dire consequences of his sinister machinations (‘How art thou fall’n from thy height!’, with solo oboe suspensions enhancing its tormented warning against worldly ambition). In 1727 Handel became a naturalized British citizen. By this time he was the principal artistic director (to use modern parlance) of the Royal Academy of Music—a company founded by Royal Charter to establish more effective governance of regular high-quality seasons of Italian operas at the King’s Theatre in the Haymarket. All of the Royal Academy’s annual seasons between 1720 and its eventual collapse in 1728 featured Giuseppe Maria Boschi (fl1703-44), who specialized in playing implacable tyrants. The title-hero in Siroe (1728) is beloved by the Persians for his valour and virtue, but his jealous father king Cosroe circumvents Siroe’s rightful succession to the throne. As the crisis worsens in the middle of Act II, Cosroe misjudges that Siroe has attempted to murder Idaspe (who is actually Siroe’s beloved Emira in disguise; she wants revenge for Cosroe’s murder of her father, and Siroe has sworn to keep her true identity secret but attempted to dissuade her; therefore, he cannot admit why they have been found together with his sword drawn). In confrontational rising minor-key figures, Cosroe sends his own son to prison and condemns him to death (‘Tu di pietà mi spogli’). As the opera reaches its dramatic climax, Cosroe realizes the execution of his innocent son was a mistake, but believes it is too late to revoke the horrific order. Feeling the icy pangs of a belated moral conscience, he expresses bitter remorse and confesses his culpability in ‘Gelido in ogni vena’, a larghetto in the extraordinary key of F sharp minor, with a restless bass line, contrapuntal strings and an anguished voice part. Boschi also played a villainous tyrant in Handel’s next opera, Tolomeo (1728). The exiled title-hero is the rightful king of Egypt but hides on Cyprus as a shepherd; a reunion with his beloved wife Seleuce is disrupted by the cruel Cypriot king Araspe, who is infatuated with Seleuce (who initially pretends to be a shepherdess called Delia). Towards the end of Act II, Tolomeo defends Seleuce from Araspe’s unwelcome amorous attention, and the couple reveal their true identities; Araspe orders his guards to bind Tolomeo in fetters, and vents scornfully that Seleuce’s weeping cannot mollify his implacable wrath (‘Piangi pur’). During the early 1730s the principal bass soloist in Handel’s opera company was Antonio Montagnana (fl1730-50). A few months before creating the role of Zoroastro in Orlando, Montagnana took part in the pasticcio Catone. Metastasio’s drama about the Roman patriot Cato’s preference to commit suicide rather than submit to the dictator Julius Caesar was first set to music by Vinci (Rome, 1728), but the poet’s own revised version was soon set to music by Leo (Venice, 1728). Handel might have seen Leo’s version whilst in Italy recruiting new singers, and its overture and nine arias were the basis of the pasticcio produced by Handel’s company in London; the rest of the arias were swapped for music by Hasse (six arias), Porpora (four), Vivaldi (at least two) and Vinci (one). It is unlikely Handel chose many (if any) of these substitutions—most were taken from the repertoire of the singers in his company. Julius Caesar’s ‘È ver che all’amo intorno’ (Act III, scene 4) is a generic simile aria expressing optimism that the disappointed angler will eventually hook an elusive fish from the stream if he has enough patience; featuring an elaborate bassoon obbligato, the suave showpiece was taken from Porpora’s Poro (Turin, 1731). The notion of morally upright defiance against a wicked dictator is also explored in the oratorio Athalia (Oxford, 1733). Fed up with the idolatry and evil perpetrated upon Judah by Queen Athalia (the daughter of Jezebel), the piety of the righteous Israelites is established in the oratorio’s extended opening scene, which includes ‘When storms the proud’. Assigned to an anonymous priest in the printed wordbook, Handel clarified in his autograph score that this bass air is ‘in Abners part’. The music is set in a vigorous style that makes prominent use of two oboes and bassoons independent from the strings, and there is bustling word-painting to depict storminess on the line ‘He rolls the thunder through the gloom’. In Part Two, during the festival of Shavuot, Abner reacts with hearty enthusiasm to the high priest Joad’s cautious question about whether the captain would support a coup d’état if a suitable true descendant of David had survived (Athalia thinks she has killed them all—even her own grandchildren). Abner’s assertive ‘Ah, canst thou but prove me!’ makes his allegiances abundantly clear—and it is a key moment that persuades Joad to unveil the rightful heir Joas (a boy who does not yet know his true identity, and has been kept safely and secretly at the temple). From 1736 onwards Handel’s most regular principal bass soloist was the Dresden-trained singer Henry Theodore Reinhold (d1751), whose most notable theatrical success was in the role of the Dragon in Lampe’s comedy The Dragon of Wantley (1737). Seemingly adept at bluff, extrovert music, his role as an inconsolable grieving father in Belshazzar (1745) suggests that Reinhold was expressively versatile. The debauched titular libertine has murdered the son of the Babylonian lord Gobrias—an act of wickedness caused by jealousy that has motivated Gobrias to become an ally of the Persian invader Cyrus, whose army is camped outside the seemingly impregnable walls of Babylon. Before we witness the musical depiction of Belshazzar hedonistically feasting from sacred vessels stolen from the Jerusalem temple, and the ominous judgment of God’s writing on the wall, Gobrias confides to the virtuous hero Cyrus that he is continually ‘Opprest with never-ceasing grief’. Handel’s psychologically complex music expresses the character’s hope that revenge will provide succour, but it transpires that even after Belshazzar’s ignominious defeat no victory can fully compensate Gobrias for the death of his son. Reinhold also first performed the part of Caleb in Joshua (1748). One of the militaristic oratorios Handel wrote to please the London public following the second Jacobite rebellion in 1745, the anonymous libretto presents a series of set pieces that convey the thinly veiled allegory that God’s chosen Israelites are similar to the patriotic British. At the beginning of Part Two, the walls of Jericho fall after Priests carry the Ark of the Covenant around the city walls seven times while blowing trumpets; Caleb describes the destruction of the city in the turbulent ‘See, the raging flames arise’. After some setbacks, the conquest of Canaan is completed and celebrated in Part Three; Caleb’s ‘Shall I in Mamre’s fertile plain’ is a response to Joshua granting the veteran warrior and his family the land of Hebron (where their ancestor Abraham is buried); in a gentle largo that suggests Caleb looks forward eagerly to peaceful retirement, he offers ‘Eternal praise to Heav’n’s high King’. While Handel’s status as the inventor of English oratorio has never been in doubt, and his reputation as an opera composer has risen to the highest rank in the last half-century, his contemporaries were probably quicker to esteem him as a virtuoso harpsichordist and organist, a pioneer of the keyboard concerto, and for his masterful chamber sonatas and orchestral works. In 1734 the London music-seller John Walsh printed six mixed concertos cobbled together haphazardly from various pieces Handel had written for different occasions, and called it Opus 3; it seems that the composer was not involved in Walsh’s compilation, nor gave it his authority, but it is certain that the four-movement concerto in F major featuring a pair of oboes (Op 3 No 4) was performed as a ‘Symphony’ at the King’s Theatre during a revival of Amadigi on 20 June 1716—a benefit night for the opera house orchestra. Aucun compositeur du début du XVIIIe siècle n’utilisa aussi bien que Haendel le vocabulaire musical pour traduire tout l’éventail de personnalités dramatiques complexes. Cet album en présente un assortiment qui s’échelonne sur l’ensemble de la longue carrière du compositeur, depuis une cantate italienne de jeunesse jusqu’à ses oratorios anglais écrits quarante ans plus tard. Il y a dans ces exemples humour, cruauté, affection, tyrannie, loyauté, culpabilité, tristesse et célébration (parfois plusieurs d’entre eux à la fois), et ils illustrent la manière dont Haendel traduisit avec imagination et de façon charmante les situations difficiles de différents personnages. Plusieurs sont des tyrans politiques que la soif de pouvoir (ou le désir d’une femme, ou les deux) rend incontrôlables, d’autres sont des tyrans menaçants pour qui l’on peut ressentir un mélange de dégoût et d’empathie, mais en général la voix de basse est aussi celle que préférait le compositeur pour des pères inquiets se faisant du souci pour leurs enfants, ou pour des hommes braves et fidèles en des temps de bouleversement politique et de guerre. Après avoir quitté sa ville natale de Halle à la fin de son adolescence, Haendel découvrit l’opéra à Hambourg, puis parcourut l’Italie pendant plus de trois ans. À Naples, il composa Nell’africane selve (HWV 136a) au cours de l’été 1708. Accompagnée uniquement des instruments du continuo, cette cantate de chambre est un tour de force pour une basse virtuose qui traverse de brusques contrastes dramatiques, une vive imagerie et de larges sauts à travers une tessiture de plus de deux octaves et demie (do dièse grave–la aigu). Le récitatif d’introduction versatile souligne que même un lion fier et majestueux dans les forêts d’Afrique, insensible aux hurlements des bêtes et aux sifflements des serpents, peut voir son courage ébranlé s’il est surpris par la torche insidieuse et brillante d’un chasseur; le poème révèle ensuite que les pleurs misérables du lion impuissant au moment de sa capture est une allégorie de la propre perte de liberté et de confiance du poète maintenant qu’il est tombé profondément amoureux de la beauté arcadienne Nice. L’aria «Langue, trema, e prigioniero» comporte des défis techniques diaboliques, mais la musique est également mélodieuse et intimement lyrique, et la conclusion mélancolique «Chiedo amore» peut être interprétée de manière séduisante. On ignore l’identité du chanteur qui en assura la création, mais il s’agit sans doute de la même basse extraordinaire qui chanta le cyclope meurtrier dans la serenata Aci, Galatea e Polifemo (également donnée à Naples au cours de l’été 1708). Quelques mois après avoir quitté l’Italie, Haendel fut engagé par l’Électeur de Hanovre (qui allait bientôt devenir Georges Ier de Grande-Bretagne), mais il reçut tout de suite l’autorisation de se rendre en Angleterre à la fin de l’année 1710. Peu après son arrivée, il reçut la commande de Rinaldo (1711)—le premier opéra entièrement italien créé spécialement pour la scène londonienne. L’infâme Argante est le roi infidèle de Jérusalem; après des pourparlers agressifs avec les héros croisés chrétiens qui n’avaient débouché sur aucun résultat, il reste seul et fait venir Armida—une sorcière amazonienne volage dont il a désespérément besoin pour vaincre l’ennemi aux portes de Jérusalem. Elle est non seulement l’arme secrète d’Argante mais encore son amante—comme nous l’explique l’invocation murmurée avec mélancolie «Vieni, o cara» avec un érotisme transparent. En 1712, Haendel s’installa définitivement à Londres mais, entre 1717 et 1720, il passa au moins quelque temps à titre d’invité à Cannons, le domaine de James Brydges, comte de Carnarvon. Le premier oratorio anglais, Esther, fut probablement exécuté pour Brydges vers 1720: l’orgueilleux et vindicatif conseiller Haman complote avec jubilation le génocide des Juifs exilés, mais sa traîtrise cruelle est révélée par la femme du roi perse Assuérus, la nouvelle reine Esther, elle-même juive mais cela reste jusqu’alors secret. Condamné à mort par le roi indigné, Haman, ébranlé, implore Esther de lui pardonner et d’intercéder en son nom (l’air feutré «Turn not, O Queen, thy face away», avec de douces pulsations aux cordes). Esther rejette avec fermeté la demande de grâce mielleuse du politicien rusé; elle le force à assumer les conséquences désastreuses de ses sinistres machinations («How art thou fall’n from thy height!», avec des suspensions de hautbois solo qui soulignent sa mise en garde tourmentée contre l’ambition terrestre). En 1727, Haendel acquit la nationalité britannique. Il était alors principal directeur artistique (pour utiliser le langage moderne) de la Royal Academy of Music—compagnie fondée par une chartre royale pour créer une meilleure gouvernance de saisons d’opéras italiens de grande qualité au King’s Theatre à Haymarket. Toutes les saisons annuelles de la Royal Academy entre 1720 et son effondrement en 1728 présentaient Giuseppe Maria Boschi (célèbre entre 1703 et 1744), qui se spécialisa dans les rôles de tyrans implacables. Dans Siroe (1728), le héros du titre est très apprécié des Perses pour sa bravoure et sa vertu, mais son père jaloux, le roi Cosroe, l’écarte de sa succession légitime au trône. La crise s’aggrave au milieu de l’acte II et Cosroe pense à tort que Siroe a tenté d’assassiner Idaspe (qui est en réalité Emira, l’amante de Siroe déguisée; elle veut venger le meurtre de son père commis par Cosroe; Siroe a juré de garder secrète sa véritable identité tout en tentant de la dissuader; Cosroe ne peut donc comprendre la raison pour laquelle Siroe se trouvait en compagnie d’Idaspe l’épée à la main). Dans des figures ascendantes conflictuelles dans une tonalité mineure, Cosroe envoie son propre fils en prison et le condamne à mort («Tu du pietà mi spogli»). Quand l’opéra atteint son sommet dramatique, Cosroe réalise que l’exécution de son fils innocent est une erreur, mais pense qu’il est trop tard pour annuler son ordre. Sa conscience lui dicte de tardifs remords qu’il exprime amèrement en avouant sa culpabilité dans «Gelido in ogni vena», un larghetto dans l’extraordinaire tonalité de fa dièse mineur, avec une basse fébrile, des cordes contrapuntiques et une partie vocale angoissée. Boschi interpréta aussi un infâme tyran dans l’opéra suivant de Haendel, Tolomeo (1728). Le héros en exil du titre est le roi légitime d’Égypte mais il se cache à Chypre déguisé en berger; des retrouvailles avec sa femme bien-aimée Seleuce sont interrompues par le cruel roi chypriote Araspe, qui s’est entiché de Seleuce (qui prétend d’abord être une bergère du nom de Delia). À la fin de l’acte II, Tolomeo défend Seleuce contre les sollicitations amoureuses et importunes d’Araspe, et le couple révèle sa véritable identité; Araspe ordonne à ses gardes d’enchaîner Tolomeo et lâche avec mépris que les pleurs de Seleuce ne pourront apaiser sa colère implacable («Piangi pur»). Au début des années 1730, la principale basse soliste dans la troupe d’opéra de Haendel était Antonio Montagnana (célèbre entre 1730 et 1750). Quelques mois avant de créer le rôle de Zoroastro dans Orlando, Montagnana participa au pastiche Catone. Le drame de Métastase, sur le patriote romain Caton qui préfère se suicider que se soumettre au dictateur Jules César, fut mis en musique pour la première fois par Vinci (Rome, 1728), mais la propre version révisée du poète donna lieu bientôt à un opéra de Leo (Venise, 1728). Haendel vit peut-être la version de Leo lorsqu’il était en Italie pour recruter de nouveaux chanteurs, et son ouverture et neuf arias furent la base du pastiche produit par la troupe de Haendel à Londres; les autres arias furent remplacées par de la musique de Hasse (six arias), Porpora (quatre), Vivaldi (au moins deux) et Vinci (une). Il est peu probable que Haendel ait lui-même choisi l’essentiel (voire une seule) de ces substitutions—la plupart furent tirées du répertoire des chanteurs de sa troupe. «È ver che all’amo intorno» de Julius Caesar (acte III, scène 4) est un générique d’aria simile exprimant l’optimisme: le pêcheur déçu finira par prendre un poisson insaisissable du ruisseau s’il a assez de patience; avec un obbligato élaboré de basson, ce suave joyau fut emprunté à Poro (Turin, 1731) de Porpora. La notion de défi irréprochable sur le plan moral à l’encontre d’un dictateur cruel est également explorée dans l’oratorio Athalia (Oxford, 1733). La piété des vertueux Israélites, lassés de l’idolâtrie et du mal perpétré par la reine Athalia (fille de Jézabel), apparaît dans la longue scène initiale, qui comprend «When storms the proud». Distribué à un prêtre anonyme dans le livret imprimé, Haendel expliqua, dans sa partition autographe, que cet air de basse faisait partie «du rôle d’Abner». La musique a un style vigoureux qui fait un usage important de deux hautbois et bassons indépendants des cordes, et on y trouve une peinture trépidante des mots pour traduire l’agitation sur le vers «He rolls the thunder through the gloom». Dans la seconde partie, au cours de la fête de Shavuot (fête des prémices), Abner réagit avec beaucoup d’enthousiasme à la question circonspecte du grand-prêtre Joad qui demande au chef de l’armée de Judée s’il soutiendrait un coup d’État si un véritable descendant légitime de David avait survécu (Athalia pense les avoir tous tués—même ses propres petits-enfants). L’affirmation d’Abner «Ah, canst thou but prove me!» rend son allégeance très claire—et c’est un moment clef qui convainc Joad de dévoiler l’héritier légitime Joas (un garçon qui ne connaît pas encore sa véritable identité, et qui a été gardé en sécurité et en secret au temple). À partir de 1736, la basse principale soliste la plus habituelle de Haendel fut le chanteur Henry Theodore Reinhold (mort en 1751). Il avait été formé à Dresde et remporta son succès le plus notable au théâtre dans le rôle du Dragon dans la comédie de Lampe The Dragon of Wantley (1737). Apparemment spécialisé dans la musique directe et extravertie, le rôle de père affligé et inconsolable qu’il tenait dans Belshazzar (1745) laisse entendre que Reinhold était polyvalent sur le plan de l’expression. Le libertin débauché a assassiné le fils du noble babylonien Gobrias—un acte de cruauté perpétré par jalousie et qui a poussé Gobrias à devenir l’allié de l’envahisseur perse Cyrus, dont l’armée campe à l’extérieur des murs apparemment imprenables de Babylone. Avant d’en venir à la représentation musicale du festoiement hédoniste de Belshazzar dans des vases sacrés volés au temple de Jérusalem et au jugement inquiétant écrit par Dieu sur le mur, Gobrias confie au héros vertueux Cyrus qu’il est continuellement «Opprest with never-ceasing grief» («sans cesse accablé par le chagrin»). La musique de Haendel, complexe sur le plan psychologique, exprime l’espoir du personnage qui espère que la revanche lui viendra en aide, mais il apparaît par la suite que même après la défaite ignominieuse de Belshazzar aucune victoire ne peut consoler Gobrias de la mort de son fils. Reinhold créa aussi le rôle de Caleb dans Joshua (1748), l’un des oratorios militaristes qu’écrivit Haendel pour plaire au public londonien après la seconde rébellion jacobite en 1745. Le livret anonyme comporte une série de numéros qui traduisent l’allégorie à peine voilée selon laquelle les Israélites choisis par Dieu sont comparables aux Britanniques patriotes. Au début de la deuxième partie, les murs de Jéricho tombent après que les prêtres aient porté sept fois l’Arche d’Alliance autour des murs de la ville en sonnant des trompettes; Caleb décrit la destruction de la ville dans le turbulent «See, the raging flames arise». Après quelques revers, la conquête de Canaan est achevée et célébrée dans la troisième partie; «Shall I in Mamre’s fertile plain» de Caleb est une réponse à Josué dans laquelle il accorde au vieux guerrier et à sa famille le pays d’Hébron (où est enterré leur ancêtre Abraham); dans un doux largo qui laisse entendre que Caleb espère avec impatience une retraite paisible, il offre «Eternal praise to Heav’n’s high King» («louange éternelle au très haut roi des cieux»). Si l’on n’a jamais contesté à Haendel le statut d’inventeur de l’oratorio anglais et si sa réputation de compositeur d’opéra est porté aux nues depuis un demi-siècle, ses contemporains ont sans doute attendu moins longtemps pour le considérer comme un virtuose du clavecin et de l’orgue, un pionnier du concerto pour clavier et pour estimer à leur juste valeur ses magistrales sonates de chambre et ses œuvres pour orchestre. En 1734, le marchand de musique John Walsh imprima six concertos variés concoctés au petit bonheur d’après diverses pièces que Haendel avait écrites en différentes occasions, et les intitula Opus 3; il semble que le compositeur ne fut ni impliqué dans la compilation de Walsh, ni ne lui donna son autorisation, mais il est certain que le concerto en quatre mouvements en fa majeur dans lequel figurent deux hautbois (op.3 no 4) fut joué comme une «Symphonie» au King’s Theatre lors d’une reprise d’Amadigi le 20 juin 1716—une soirée de bienfaisance pour l’orchestre de l’opéra. In der Kunst, mit den Mitteln der Musik die ganze Bandbreite komplexer Bühnenrollen darzustellen, kam im frühen 18. Jahrhundert kein Komponist Händel gleich. Dieses Album enthält eine Auswahl glanzvoller Beispiele, welche die gesamte Dauer seiner schöpferischen Biografie umspannt, von einer frühen italienischen Kantate bis hin zu den englischen Oratorien, die er vierzig Jahre später komponierte. Ob Humor, Grausamkeit, Zuneigung oder Herrschsucht, Treue, Schuldverstrickung, Trauer oder Feierlichkeit—all das, manchmal auch in Kombinationen—kommt hier vor und zeigt, wie fantasievoll und beredt Händel auf die Nöte seiner Bühnenfiguren einging. Darunter sind Tyrannen, denen in ihrer Gier nach Macht (oder nach Frauen, oder gleich nach beidem) die Beherrschung entgleitet; drohende Gewalttäter, für die wir eine Mischung aus Mitleid und Abscheu empfinden mögen. Doch wählte Händel die Bassstimme auch gern für Väter in Sorge um ihre Kinder oder auch für Männer, die auch im Angesicht politischer Wirren oder des Krieges standhaft bleiben. Nachdem der noch nicht zwanzigjährige Händel seine Geburtsstadt Halle verlassen hatte, lernte er in Hamburg die Oper kennen und reiste dann für drei Jahre durch Italien. Nell’africane selve (HWV136a) komponierte er im Sommer 1708 in Neapel. Diese nur vom Basso continuo begleitete Kantate ist mit ihren schroffen dramatischen Kontrasten, ihrer lebhaften Bildsprache und den großen Sprüngen durch einen Umfang von über zweieinhalb Oktaven—vom tiefen Cis bis zum eingestrichenen A—für den Basssolisten eine wahre Tour de force. Im wechselvollen Rezitativ zu Beginn ist die Rede vom Löwen in den Wäldern Afrikas, den weder Tiergebrüll noch zischende Schlangen schrecken, dessen Mut aber ins Wanken gerät, wenn plötzlich die schleichende Fackel eines Jägers auflodert. Im Weiteren entfaltet das Gedicht die Allegorie, dass das erbarmungswürdige Klagen des gefangenen Löwen für des Dichters eigene Trauer um seine verlorene Freiheit stehe, seit er der arkadischen Schönheit Nice in Liebe verfallen sei. Die Arie „Langue, trema, e prigioniero“ hält etliche technische Fallstricke bereit, doch ist die Musik zugleich melodisch und innig, und der melancholische Schluss „Chiedo amore“ kann als Verführungsgeste verstanden werden. Wem Händel das Stück gewissermaßen in die Gurgel schrieb, ist unbekannt; doch war es wahrscheinlich derselbe außergewöhnliche Sänger, der die Partie des mörderischen Zyklopen in der Serenade Aci, Galatea e Polifemo sang, die ebenfalls im Sommer 1708 in Neapel aufgeführt wurde. Wenige Monate, nachdem er Italien den Rücken gekehrt hatte, fand Händel Anstellung beim Kurfürsten von Hannover, dem späteren König Georg I. von Großbritannien. Unverzüglich wurde ihm die Erlaubnis erteilt, Ende 1710 nach England zu reisen. Bald nach seiner Ankunft bekam er den Auftrag zur Komposition des Rinaldo (1711)—der ersten durchweg italienischen Oper für eine Londoner Bühne. Der Schurke Argante herrscht als treuloser König über Jerusalem; nachdem seine aggressiven Verhandlungen mit den Kreuzfahrern zu keinem Ergebnis führen, bleibt er allein und ruft Armida zu sich, eine verschlagene Amazonen-Hexe, deren Hilfe er dringend braucht, um den Feind vor den Toren zu besiegen. Sie ist aber nicht nur seine Geheimwaffe, sondern auch seiner Geliebte: Das ist Inhalt der wehmütigen, halblauten Arie „Vieni, o cara“ mit ihrem unverkennbar erotischen Tonfall. 1712 ließ sich Händel endgültig in London nieder; zwischen 1717 und 1720 jedoch verbrachte er zumindest einige Zeit auf Cannons, dem Landgut James Brydges’, des Grafen von Carnavon. Das erste englische Oratorium Esther wurde wohl um 1720 für Brydges aufgeführt: Der arrogante und tückische Ratgeber Haman plant voller Häme den Mord an den Juden im persischen Exil; sein grausamer Verrat wird dem Perserkönig Assuerus jedoch von der neuen Königin Esther entdeckt, die ihre jüdische Herkunft bislang verheimlicht hat. Als er vom empörten König zum Tod verurteilt wird, fleht der verängstigte Haman Esther an, ihm zu vergeben und ein gutes Wort für ihn einzulegen (das sachte „Turn not, O Queen, thy face away“ über zartem Pulsieren der Streicher). Esther jedoch weist das schmeichlerische Gnadengesuch des verschlagenen Politikers entschieden zurück und zwingt ihn, die Folgen seiner Machenschaften zu erleiden („How art thou fall’n from thy height!“, wo die Vorhalte im Oboensolo zur Warnrufen vor weltlichem Streben werden). 1727 wurde Händel britischer Bürger. Inzwischen war er zum—wie man heute sagen würde—künstlerischen Leiter der Royal Academy of Music aufgestiegen, einer teils unter königlicher Aufsicht stehenden Operntruppe, die mit dem Ziel gegründet worden war, dauerhaft für anspruchsvolle italienische Opern im King’s Theatre am Haymarket zu sorgen. In sämtlichen Spielzeiten der Royal Academy von ihrer Gründung 1720 bis zu ihrem Untergang 1728 trat Giuseppe Maria Boschi auf (als Sänger aktiv 1703-1744), der sich auf die Darstellung gnadenloser Herrscher spezialisiert hatte. Den Titelhelden der Oper Siroe (1728) lieben die Perser für seine Tapferkeit und Tugenhaftigkeit, doch König Cosroe, sein eifersüchtiger Vater, hintertreibt seinen Anspruch auf den Thron. Als sich die Lage zur Mitte des 2. Aktes hin zuspitzt, verurteilt Cosroe Siroe wegen eines Mordversuches an Idaspe—zu Unrecht (tatsächlich ist sie Siroes verkleidete Geliebte Emira; sie möchte den Mord Cosroes an ihrem Vater rächen, Siroe wiederum hat versprochen, ihr Inkognito zu wahren, zugleich aber versucht, sie umzustimmen; deshalb hat er keine Erklärung dafür, dass er beim Treffen mit ihr mit gezogenem Schwert aufgegriffen wurde). Auf dem dramatischen Höhepunkt der Oper erkennt Cosroe, dass die Hinrichtung seines schuldlosen Sohnes ein Fehler war, glaubt aber, es sei zu spät, den grausamen Befehl zu widerrufen. Von seinem Gewissen gequält, bekennt er bittere Reue und Schuld in „Gelido in ogni vena“, einem Larghetto in seltenem fis-Moll mit unruhiger Basslinie, kontrapunktischen Streicherstimmen und beklommener Gesangspartie. Einen finsteren Tyrannen spielte Boschi auch in der folgenden Oper Händels, dem Tolomeo (1728). Der verbannte Titelheld ist rechtmäßiger König Ägyptens, verbirgt sich jedoch als Schäfer auf Zypern. Sein Wiedersehen mit der geliebten Gattin Seleuce wird von Araspe gestört, dem grausamen König Zyperns, der in Seleuce verliebt ist (die sich zunächst als Schäferin namens Delia ausgibt). Am Ende des 2. Aktes kommt Tolomeo Seleuce gegen die unerwünschten Avancen Araspes zu Hilfe, und beide geben ihre wirklichen Namen preis; Araspe befiehlt seinen Soldaten, Tolomeo in Ketten zu legen, und verkündet voller Rachsucht, dass Seleuces Klagen seinen unerbittlichen Zorn nicht besänftigen können („Piangi pur“). Während der frühen 1730er-Jahre war Antonio Montagnana (als Sänger tätig 1730–1750) der wichtigste Bassist in Händels Operntruppe. Einige Monate vor der Uraufführung des Orlando, in der er den Zoroastro sang, wirkte Montagnana in dem Pasticcio Catone mit. Von Metastasio stammte das Drama um den römischen Patrioten Cato, der eher in den Freitod ging, als sich dem Diktator Julius Cäsar zu beugen. Erstmals komponiert wurde es 1728 in Rom von Leonardo Vinci, die vom Dichter überarbeitete Fassung dann 1728 in Venedig von Leonardo Leo. Diese Version mochte Händel gesehen haben, als er in Italien auf Suche nach neuen Sängern war; die Ouvertüre und neun Arien wurden zum Grundstock des Pasticcios, das Händels Truppe in London auf die Bühne brachte. Die übrige Musik stammte von Hasse (sechs Arien), Porpora (vier Arien), Vivaldi (mindestens zwei Arien) und Vinci (eine Arie). Dass hauptsächlich Händel diese Auswahl traf, ist unwahrscheinlich; die meisten entstammten dem Repertoire seiner Sänger. Die Arie des Julius Cäsar „È ver che all’amo intorno“ (2. Akt, 4. Szene) ist eine typische „Simile-Arie“: Cäsars Optimismus drückt sie mit der Metapher vom Angler aus, der zunächst enttäuscht ist, weil der Fisch ihm immer wieder entkomme; mit Geduld werde er ihn aber schließlich aus dem Wasser ziehen. Das eingängige Virtuosenstück mit seinem ausführlichen Fagottsolo entstammt dem Poro (Turin 1731) von Porpora. Tugendsame Standhaftigkeit gegen Herrschertücke ist auch Gegenstand des Oratoriums Athalia (Oxford 1733). Die Israeliten haben genug von Götzendienst und Böswilligkeit der Königin Athalia, der Tochter Isebels; in der ausgedehnten Anfangsszene des Oratoriums bringen sie ihre Gottestreue zum Ausdruck, unter anderem in „When storms the proud“. Ist diese Bassarie im Libretto einem ungenannten Priester zugewiesen, so notierte Händel in seiner Partiturhandschrift, sie gehöre „in Abners part“. In der energischen Musik sind prominente Partien für je zwei Oboen und Fagotte vorgesehen; lebhafte Wortmalereien bringt sie dort, wo es heißt „He rolls the thunder through the gloom“. Im 2. Teil bekundet Abner auf dem Schawuot-Fest begeisterte Zustimmung, als der Hohepriester Joad vorsichtig die Frage andeutet, ob der Hauptmann einen Staatsstreich unterstützen würde, wenn ein wahrer Nachkomme Davids überlebt hätte (Athalia glaubt, sie habe alle umgebracht, selbst ihre eigenen Enkel). Welche Seite er wählt, macht Abner unmissverständlich klar in seinem „Ah, canst thou but prove me!“—ein Wendepunkt, an dem Joad den Entschluss fasst, die Existenz des rechtmäßigen Thronfolgers Joas zu offenbaren, eines Knaben, der von seiner wahren Herkunft noch nichts weiß und im Tempel im Verborgenen gelebt hat. Von 1736 an sang der aus Dresden stammende Henry Theodore Reinhold (†1751) die meisten Bass-Hauptpartien Händels; seinen größten Bühnenerfolg feierte er als Drache in der Komödie The Dragon of Wantley von Lampe (1737). Lagen ihm also offenbar raubeinige, extrovertierte Figuren, so lässt seine Besetzung als verzweifelt trauernder Vater in Belshazzar (1745) auf darstellerische Vielseitigkeit schließen. Der dekadente Titelheld hat den Sohn des babylonischen Fürsten Gobrias umgebracht—eine Untat aus Eifersucht, die Gobrias veranlasst, sich mit dem persischen Eroberer Cyrus zu verbünden, dessen Armee vor den scheinbar unüberwindlichen Mauern Babylons liegt. Es kommt zur musikalischen Schilderung des frevlerischen Festmahls, bei dem Belshazzar aus dem geraubten Tempelgeschirr aus Jerusalem speist, und des an die Wand geschriebenen unheilvollen Gottesurteils; doch noch zuvor offenbart Gobrias dem edlen Helden Cyrus, er sei „Opprest with never-ceasing grief“ („von nie endendem Kummer bedrückt“). Die psychologisch komplexe Musik Händels drückt Gobrias’ Hoffnung aus, dass Rache ihm das Herz erleichtern werde; doch lässt er auch erkennen, dass selbst nach dem schändlichen Ende Belshazzars kein Sieg ihn je für den Tod seines Sohnes werde entschädigen können. Reinhold war es auch, der erstmals den Caleb in Joshua (1748) darstellte, einem jener kriegsseligen Oratorien, mit denen sich Händel im Nachgang des zweiten Jakobitenaufstands (1745) den Beifall des Londoner Publikums zu sichern suchte. Das Libretto eines ungenannten Verfassers besteht aus einer Folge von Standardszenen, die in kaum verschleierter Bildhaftigkeit das Gottesvolk der Israeliten gleichsetzen mit den vaterlandstreuen Briten. Zu Beginn des 2. Teils stürzen die Mauern Jerichos ein, nachdem Priester die Bundeslade sieben Mal zum Schall der Posaunen um sie herum getragen haben; die Zerstörung der Stadt schildert Caleb in der turbulenten Arie „See, the raging flames arise“. Nach einigen Rückschlägen ist Kanaan schließlich ganz erobert, was im 3. Teil gefeiert wird. Caleb antwortet mit seiner Arie „Shall I in Mamre’s fertile plain“ darauf, dass Joshua dem treuen Krieger und seiner Familie das Land Hebron schenkt, wo Abraham begraben liegt. In einem sanften Largo, das Calebs Vorfreude auf einen friedvollen Ruhestand erkennen lässt, singt er „Eternal praise to Heav’n’s high King“ („ewiges Lob dem König des Himmels“). Zwar stand Händels Rolle als Erfinder des englischen Oratoriums nie in Frage, und auch sein Ruf als Opernkomponist ersten Ranges hat sich über die vergangenen fünf Jahrzehnte gefestigt. Seine Zeitgenossen jedoch sahen in ihm wohl eher den Cembalo- und Orgelvirtuosen und einen Pionier des Tastenkonzerts, ebenso wie den meisterlichen Schöpfer von Kammer- und Orchestermusiken. 1734 druckte der Londoner Musikalienhändler John Walsh sechs willkürlich zusammengestellte Concerti für unterschiedliche Besetzungen, die Händel zu verschiedenen Gelegenheiten komponiert hatte, und nannte sie Opus 3; offenbar hatte der Komponist mit Walshs Zusammenstellung nichts zu tun und hatte auch seine Zustimmung nicht gegeben. Sicher ist jedoch, dass das viersätzige Concerto F-Dur mit zwei Oboen (op. 3 Nr. 4) aus Anlass der Wiederaufnahme von Amadigi am 20. Juni 1716 im King’s Theatre als „Symphonie“ erklang, einem Benefizabend zugunsten des Opernorchesters.